Bandag National Fleet Tyres & Services are innovative, proven and provide solid solutions for Blue Chip Fleet Companies. 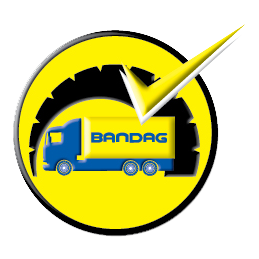 For over a decade, Bandag SA has been involved with multiple depot fleets over which time it has developed the Bandag Tyre Management Philosophy. Improved Vehicle Uptime - Keeping the vehicles operationally ready with tailor made Service Level Agreements. Predictable and Optimum CPK Performance - Selecting the right tyre product & service for the optimum Fleet Cost Per Kilometre (CPK). Increased Product Reliability – Consistency of Bandag best practice procedures nationally. Up to Date Performance Reviews – Tyre management information is discussed and reviewed between the customer’s National Fleet Manager and Bandag to ensure constant improvement on the global fleet tyre performance. Comprehensive Coverage - The breadth and scope of Bandag’s distribution network ensures fleets that there is a Bandag service provider nearby giving “Best in the industry“ turnaround times.